The U.S. National Security Agency is able to crack protective measures on iPhones, BlackBerry and Android devices, giving it access to users' data on all major smartphones, according to a report Sunday in German news weekly Der Spiegel. The data obtained this way includes contacts, call lists, SMS traffic, notes and location information, Der Spiegel reported. The documents don't indicate that the NSA is conducting mass surveillance of phone users but rather that these techniques are used to eavesdrop on specific individuals, the magazine said. The article doesn't explain how the magazine obtained the documents, which are described as "secret." 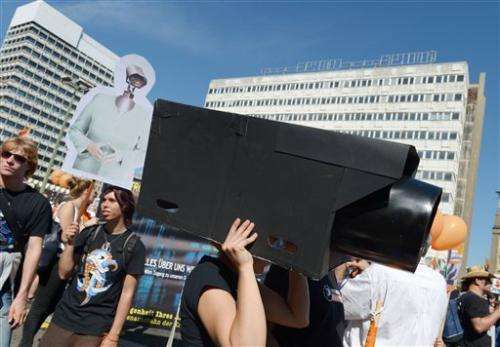 But one of its authors is Laura Poitras, an American filmmaker with close contacts to NSA leaker Edward Snowden who has published several articles about the NSA in Der Spiegel in recent weeks. The magazine printed several slides alleged to have come from an NSA presentation referencing the film "1984," based on George Orwell's book set in a totalitarian surveillance state. The slides—which show stills from the film, former Apple Inc. chairman Steve Jobs holding an iPhone, and iPhone buyers celebrating their purchase—are captioned: "Who knew in 1984...that this would be big brother...and the zombies would be paying customers?" Snowden's revelations have sparked a heated debate in Germany about the country's cooperation with the United States in intelligence matters. 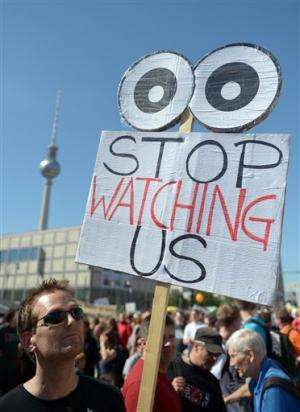 On Saturday, thousands of people in Berlin protested the NSA's alleged mass surveillance of Internet users. Many held placards with slogans such as "Stop watching us." stop using unencripted data devices!!! Real "smartphones" indeed??? As Julian Assange said "The best kept secret is not to have any". Governments are the worst offenders. We need to spy on our governments to hold them in check. It is stupid to believe that "terrorists" would walk around with contacts on their smartphones. It is not even about "spying" on average folk, it is all about jostling for budgets, and getting info on politicos. Conclusion, they have too much of your money. It is stupid to believe that "terrorists" would walk around with contacts on their smartphones. Even if you had your contacts of a piece of flash paper ready to combust with the flick of a match, how do you actually plan on using it to call people without leaving a data trace on your handset? Stand alone individuals and small groups regularly compromise the privacy of large groups of people. Huge corporations with security budgets that dwarf the GDP of some small countries routinely have their systems breeched and their most protected data raided. Why, then, is anyone at all surprised by these developments? In the US government you have a large group of incredibly well trained, highly motivated individuals who are immune from any legal consequences and in fact rewarded for allowing the NSA and plenty of other groups you will never hear of the ability to do things like root anyone's smartphone and peruse their data. You also have the regulatory hooks firmly implanted in the flesh of these telecom companies. Any device that communicates wirelessly is subject regulation and approval by the FCC, et al. We've already seen that major technology companies allowed the NSA free access to their network architecture. Why would verizon or at&t be any different? It is time to give up on working with society and move out into the wilderness where I can be left alone. I hate that I have no privacy or anonymity. NSA employees were the kids that thought books like "Animal Farm" and "1984" were meant to be used as strategic playbooks in government administration.